Your intro made me laugh, sho nuff, never saw the film but now I must. I’m sure it’s on demand. 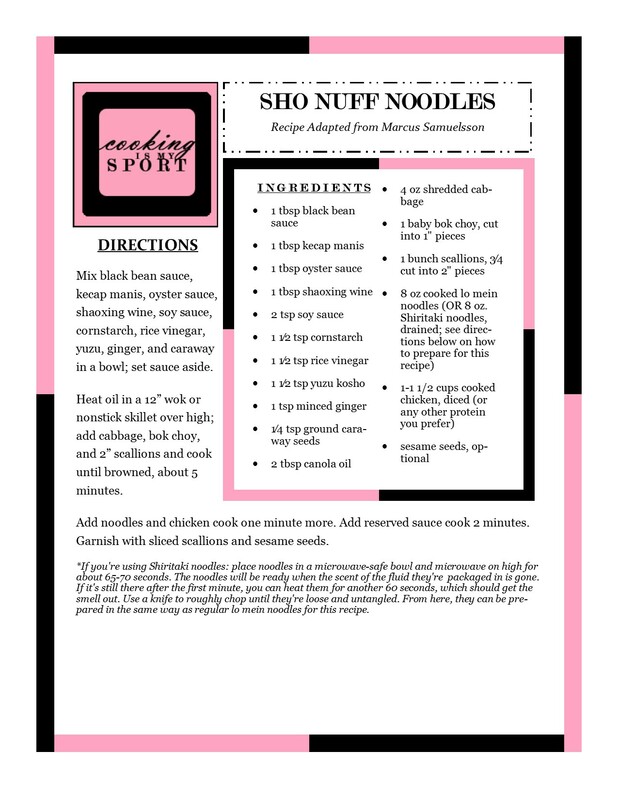 I also really love Marcus Samuelsson and this noodle recipe sounds and looks delicious, I love the mixture of Asian flavors and was intrigued by the caraway seeds. Really wonderful recipe Jess. I know it;s a lot, but they all do make a killer sauce. Thank you Ahila! A dish full of flavor and substance. Love all the different ingredients, this has got to be a winner! Happy Fiesta Friday! Oh yes! the labels . :D And you still managed to get the right things, Incredible you!! These noodles look delish! I haven’t heard of some of these ingredients so it’s unique to me but it has me drooling just looking at it. Lovely looking noodles. I can feel the amazing flavours in it. Thanks for sharing. Sho nuff, never heard of that movie, but I’ll have to look for it. Those noodles look awesome. And I love shiritaki yam noodles. Cool! And thanks for bringing this to Fiesta Friday! Please do, it’s a great underrated film even 20 + years later, I never get tired of it. I actually prefer Shiritaki noodles to most regular ones too! I can eat quite a bunch without feeling quite as full, which is always a win for me lol Thank you! This sounds incredible! I love shiratiaki noodles, and I think this is a fantastic use for them. Thank you! Shiritaki noodles are one of the best things ever invented I think. I’ve used them SO many times for noodle dishes and they’re just fantastic. This looks really delicious, Jess! There must be a ton of flavor going on with all those ingredients. It’s kind of fun to go to an Asian market and buy things you’ve never heard of before. I did that when I made an Indian dinner for my son. I had to get help a lot from the manager to find things, but it was so worth it. I bet this recipe is worth it, too, based on how good it looks! And YES. I thought I was the only one who just liked going to Asian/foreign markets just for the sake of looking around to see all the different ingredients. It makes me want to buy random ingredients off the shelves then Google recipes later to use them up lol Thank you!